People who are passionate about music fully understand what a beautiful instrument piano is. And if they get an opportunity to learn it, they would accept it without any doubts. Why wouldn’t they? It is one of the most elegant musical instruments. Once you learn this instrument, you will not only be able to play beautiful music, but the movement of your fingers on the piano will give you a sense of mental satisfaction that simply can not be explained. But these issues shouldn’t stop an enthusiast from learning the piano. 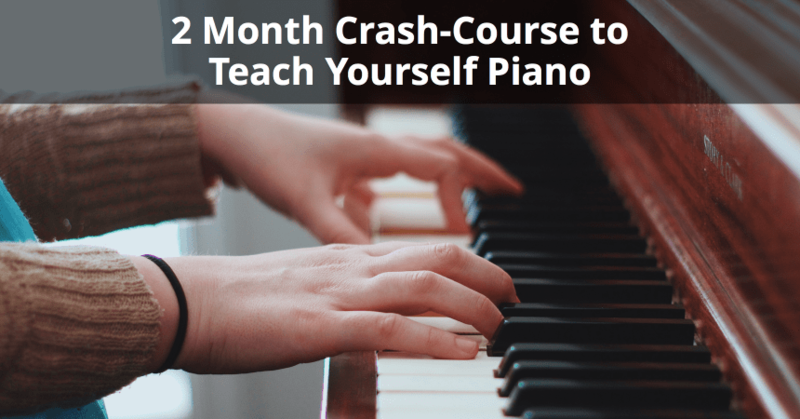 Today I am going to share a 2-month crash course which you can use to Teach Piano to yourself. But I would like to clearly state that this is not some magical plan which will make you master the instrument in a very short time. Learning Piano is a long process which requires a lot of time, commitment and dedication. I have been playing the Piano for 10 years and I still learn new stuff every day. So this action-plan is going to give you a head start, which combined with your dedication, will produce excellent results. Proper posture is important to learn the piano proficiently. Always sit upright in front of the piano without crouching. Your Fingers should be slightly curved and not straight or completely flat. Refer to the Image below. Now that you’ve got your posture right, let’s get started with our crash course. Scales are always going to be Lesson 1 of any music course (not just piano). Scales help you develop an understanding of music and how musical notes sound when played in progression. You must have heard of – Do, Re, Mi, Pha, So, La, Ti. These musical notes form our major scales. And you can start playing these notes from any key on your Piano. The key you start with will become the major scale on which these notes are played. If you are unfamiliar with names of keys on the piano. Take a look at this image and memorize the pattern. In the Above image, the Blue colored notes represent the C Major Scale. Go Ahead and play it (from C to C). Sounds Great, right? Finally, play Backwards and Forward, one after another. One thing which is very important when playing scales is using the right finger to play every note. Here is a link which explains piano scales in depth with guidelines to use the right finger every time. Play this for a while until your hands are comfortable with it. Now that you are comfortable with this, go back to the scales guide above and try out every other scale. How poor would music sound if there was no rhythm? Rhythm is extremely important to play the piano or any other instrument. Rhythm simply means the speed at which you play the song. It should always remain at a consistent speed throughout. To improve our Rhythm, we are going to practice all the scales again. I can not stress enough on the fact that scales are the fundamentals of any music course. And now that you know how to play all the different scales on the Piano. It’s time we learn to play them rhythmically. The metronome is a device which plays certain beats at a fixed interval of time. You can vary this interval depending on the speed at which you wish to play the scales. A metronome is a physical device, but now a digital Metronome is available in most modern keyboards. If your Piano or Keyboard doesn’t come with a Metronome you can download an iOS or Android app to accomplish the task. Set the Metronome to 120 Beats per minute and start practicing your scale. You should play 1 note per beat and consistently without stopping. Devote a time of 2-3 minutes to each scale. At the start of 4th week, start varying the rhythm from 100 to 180 Beats per minute. This will help you play fast paces songs in the future. Practicing rhythm using a metronome with consistency will improve your stamina and finger strength. At the end of 4th week, you will notice that you have complete command over all the scales, and you can play them in a rhythm without a metronome. Also, if you try you will be able to create melodies of many popular songs yourself without even the need for sheet music. Try to figure out the notes for Titanic theme song by yourself. As you might have already noticed, we have been using only one hand (right) to play the scales up until now. Piano is an instrument which requires our both hands and all 10 fingers at the same time. If you are not a left handed person, you might feel a little uncomfortable with your left hand at first. But it’s our goal to get comfortable with both hands. Our Weeks 5 & 6 will be dedicated to training our left hand on the piano. This simply doesn’t mean you should stop using your right hand completely. During your daily session, devote 15-20 minutes to revise all the scales and practice them with your right hand first. And then move on to your left. To train the left hand, you have to start from the very basics. Practice all the scales you learned in the first 4 weeks, but this time use your left hand. It might feel a little uncomfortable at first, but you will get used to it very quickly. It will take lesser time than it took to train the last time. Why? Because your mind & ears are already familiar with the notes on the Piano. 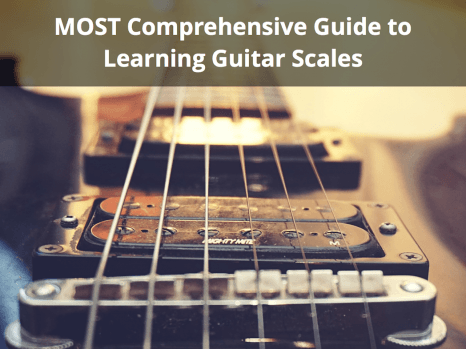 You don’t have to look at the scales chart again and again to see which notes you need to play. Regular practice for 2 weeks will help you master the scales with both hands. To verify that you have successfully trained both your hands to play a scale. Try these 2 exercises. Use both your hands to play the C Major Scale on different octaves at the same time. Use your left hand to play the C# Major Scale, while your right-hand plays the G# Major Scale at the same time. Wasn’t it fun? Let’s move on to Week 7. I will be honest with you. Chords are not something you can master in 1 week or 2 or even few months. Chords are something which will come to you naturally over a period of time. But this shouldn’t stop you from practicing the basic chords. Again, you should be able to play the chords with both your hands, together & separately. Chords are simply multiple notes played together. The most common chords are the major chords, which are formed when 3 notes are played together. Since this is a crash course, we will not dive deeper into chords & how to construct them. We will just practice the major chords as they can be used to play the majority of songs. When you jump from one chord to another to another … and so on. It forms a chord progression. Pick any 4 or 5 Random chords from the above chart, and try to play these chords in any random sequence. Practice it until you can do it without mistakes. Change the chords and/or sequence and repeat the process. Remember, you have to do this with both your hands and not just the left one. 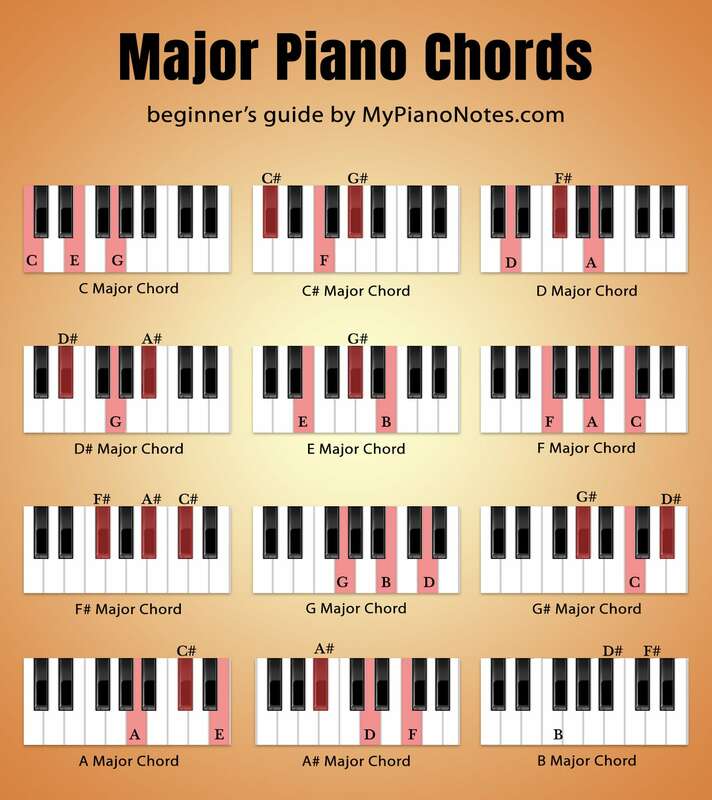 Here is an in-depth guide to piano chords for future reference. Chords are going to take a lot more practice than basic scales. Hence, it’s better to learn chords with some songs. This will also help you learn which chords should be played when. So let’s proceed to the final week of this course. This is perhaps the most important week of the entire course and it will truly tell you how honest you have been with your practice in the last 7 weeks. We are going to play some songs. But before you dive right into it, it’s important to follow a proper method to learn the songs. In the majority of songs, you will find that the right hand is used to play the melody while the left is used to play the chords. Write down all the notes and chords played in the song in a proper sequence. Train your left hand to play all the chords used in the song. Train your right hand to play the melody. Practice the rhythm. Make sure you playing the melody and chords both at the right speed. Play the melody & chords together. It would be awesome if you could practice 3 songs in the 8th week. You can choose any song. You can find tutorials for almost any song you want on YouTube. But let your first song be a tribute to my favorite pianist of all time – Ludwig van Beethoven. Here is a Beethoven’s Fur Elise Piano Tutorial, which is one of the most popular songs for beginner pianists. Let’s see if you can play it with both hands. Now that you know the basics of scales and chords, and you are comfortable playing some songs on the piano. How do you proceed further and master the instrument? The answer is simple – PRACTICE! Dig deeper into concepts of scales & chords. Use Google to research more about music theory. Spend time on your piano daily. Doesn’t matter if you play a song. Try to make music yourself. Use YouTube to find tutorials for songs, and practice them until perfection. With time you will be able to play songs without the help of any tutorial. Learning Piano is a much longer process than just 2 months. This crash-course was aimed at giving you a week by week plan so that you don’t dive unguided into the process learning piano by yourself. I’ve seen that when people try to learn piano themselves, they would completely skip scale practice dive right into songs by downloading piano notes from the internet. Some wouldn’t train their left hand to play scales and wonder why they aren’t able to play chords effectively. I hope to have prevented you from making those mistakes and this guide was useful to you. Because this was a crash course, I couldn’t cover the topics in depth. But I would recommend you to learn as much as possible about music theory, scales, chords and more. About the Author: Rohit loves to play piano. He spent a lot of time learning piano himself, before learning from a teacher. From his teacher, he learned what mistakes he was making which prevented him from becoming an effective pianist. You can follow him on MyPianoNotes.com or his YouTube channel.